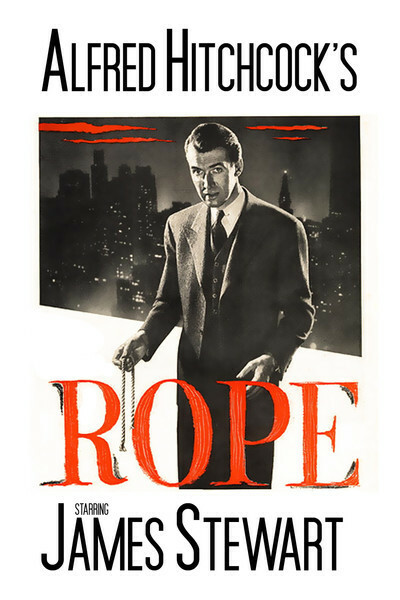 Alfred Hitchcock called “Rope” an “experiment that didn’t work out,” and he was happy to see it kept out of release for most of three decades. He was correct that it didn’t work out, but “Rope” remains one of the most interesting experiments ever attempted by a major director working with big box-office names, and it’s worth seeing this week during its revival at the Fine Arts theaters. The movie starred James Stewart, John Dall and Farley Granger in a movie version of a play that was inspired by the Leopold-Loeb murder case. In the play, two homosexual college students become fascinated by their philosophy professor’s ideas about the “innate superiority” of some people over others. Convinced they have found a victim who is inferior to them, they murder him, conceal his body in an unlocked trunk in their apartment, and then throw a dinner party with the trunk as the brazen centerpiece of the living room. The play depended, for its effect, on the fact that it was one continuous series of actions. Once the characters have entered the room, there can’t be any jumps in time, or the suspense will be lost. The audience must know that the body is always right there in the trunk. The play appealed to Hitchcock’s sense of the macabre and his fascination with situations involving the inconvenience of dead bodies. But in translating the play to the screen, he had to deal with that unity of time and space. All of the events had to take place in one uninterrupted act, and he arrived at the novel idea of shooting the movie without any visible cuts, so that it would look like one continuous shot. He built elaborate sets with movable walls on wheels. He choreographed his actors so that they and the camera could perform intricate ballets without interrupting the action. He loaded his camera with 10-¬minute magazines of film, he arranged the screenplay in 10-minute sections, and at the end of each section he used an “invisible wipe” to get to the next magazine: The camera, for example, would move behind a chair at the end of one shot, and seem to be moving out from behind it in the next. This was, of course, an unnecessary gimmick. Although when a director cuts from one shot to another it can seem as if time has passed, that is not necessarily the case. Many films that deal with uninterrupted spans of time use a lot of cuts: for example, “My Dinner with Andre,” which, despite constant cutting, never seems to miss a single bite of food or morsel of conversation. “While we were making ‘Rope,’” Stewart remembers, “I suggested to Hitch that since we were filming a play, we ought to bring bleachers into the sound stage, and sell tickets.” The final product seems curiously limp and unfocused, perhaps because Hitchcock was handcuffed by denying himself the usual grammar of camera movement and editing. In an ordinary movie, closer shots indicate more intensity, longer shots are more objective. Camera movement helps establish mood. Closeups punch home dramatic moments. Cutaways, or “reaction shots,” make it clear who is reacting, and when. Although Hitchcock tried to choreograph his 10-minute takes so that the camera would be where the drama demanded it, there are moments when it seems to be in the wrong place at the wrong time. And that trunk spends so much time in the foreground that we wonder why it’s not the immediate center of attention.